Heralded by the West Point Brass and Percussion Band performing “Grand Central Centennial Fanfare,” a new piece commissioned for the occasion, the centennial celebration of New York City’s storied Grand Central Terminal kicked off on February 1 with a rededication ceremony that included the terminal’s dedication as a Historic Civil Engineering Landmark. As part of the Grand Central Terminal Recognition Ceremony DiLoreto unveiled an ASCE Historic Civil Engineering Landmark plaque, which will be placed in the main terminal of the station. According to DiLoreto, Grand Central Terminal was recognized by ASCE’s History and Heritage Committee as a National Historic Civil Engineering Landmark because of the many unique features that set it apart from other civil engineering projects. • The terminal was built on the site of an existing train station without any interruptions to passenger train service during the entire decade of construction. The project was originally conceived by William Wilgus, chief engineer of the New York Central Railroad and a member of ASCE, and designed by the New York firm of McKim, Mead and White. Grand Central, according to the October 2011 issue of Travel + Leisure magazine, was listed as the 6th most visited tourist attraction in the world, attracting 21,600,000 people a year. Grand Central was designated a New York City Landmark in 1967 and a National Historic Landmark in 1976. In 1998, the terminal was restored to its original splendor with the completion of a two-year, $196 million restoration project that included cleaning the main concourse’s sky ceiling, constructing a new east staircase, and converting the main waiting room into an exhibition hall. The restoration work was financed by the addition of 65,000 square feet of retail space with new restaurants and a dining concourse on the lower level. 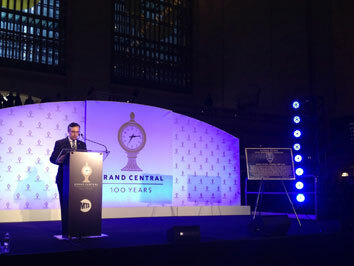 The Grand Central Terminal Rededication Ceremony featured presentations and performances from New York City Mayor Michael Bloomberg; Grand Central Centennial Committee Co-chair Caroline Kennedy; Grand Central Centennial Committee Chairman Peter Stangl; former U.S. Poet Laureate Billy Collins; Grammy Award-winning artist Melissa Manchester; former New York Mets baseball player Keith Hernandez; the Celia Cruz Bronx High School Choir; electric violinist Sarah Charness; and actress Cynthia Nixon. Aside from DiLoreto dedicating the site as an ASCE Historic Civil Engineering Landmark, Grand Central received special honors at the ceremony from the Guinness Book of World Records, the U.S. National Park Service, the National Railway Historical Society, and the U.S. Postal Service with the release of a new postage stamp. 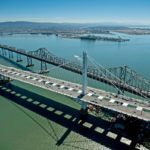 ASCE’s Historic Civil Engineering Landmark Program was created to recognize historically significant local, national, and international civil engineering projects, structures, and sites. To date, more than 250 projects worldwide have earned this prominent designation. Among them are the Hoover Dam, the Eiffel Tower, the Suez Canal, the Statue of Liberty, the Panama Canal, and the Golden Gate Bridge.